At this year's Salon International de L'Automobile in Geneva, Switzerland, Hyundai Motor Company will unveil an all-new concept car which pioneers an innovative look for the mid-sized sedan segment. A dramatic rendering gives a first glimpse of the concept car - named i-flow - which will make its world première at next month's show. Styled at the company's European design headquarters in Rüsselsheim, Germany, i-flow is expected to attract much attention, thanks to its striking appearance - the latest product of the company's evocative new form language, 'fluidic sculpture'. The name i-flow reflects the exceptionally aerodynamic shape and flowing lines of the concept car's eye-catching styling, and retains the 'i' prefix of Hyundai's newly established nomenclature. The Hyundai i-flow incorporates numerous new technologies from chemical company BASF, ranging from innovative light weight materials to solar cells, assisting in weight reduction and improvements in energy efficiency. 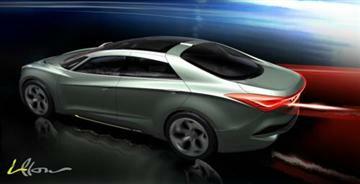 Hyundai will also showcase the latest developments of its Blue DriveTM eco-focused programme. The company is targeting global leadership in environmentally-sensitive technologies, and a host of new models and concepts look set to contribute further to reductions in emissions from new Hyundai vehicles sold globally. The i-flow will share centre stage with the all-new ix35, the company's new compact SUV, which went on sale in Australia earlier this month.